Ask fellow campers about "Maverick Ranch RV Park at Lajitas Resort" and nearby attractions. This is an RV Park that lives up to the "resort" name. The pull through sites are large and set up "buddy style" with a very large space between the coaches. It is surrounded by rugged and beautiful scenery, and the clubhouse / bathrooms/ pool house is spacious and well maintained. There is a good sized dog park. We camped at Maverick Ranch RV Park at Lajitas Resort in a Motorhome. The drive to Big Bend is a bit far, but having a pool at the end of a hot day of hiking was worth it. Very nice RV park near Big Bend National and State Parks. Very large sites - long, wide, and large amount of space between rigs. Level pull-thru blacktop sites, FHU-50, with cement patio and picnic table. Fire ring. Good internal roads; very good for big rigs. Beautiful views of multi-colored hills. Nice staff. Good wifi. Pool. TV room. No TV reception. Only some sites have cable; this is not mentioned when one reserves sites. No Verizon personal wifi (hot spots or other). Verizon phone service low or nonexistent. Except for the park WIFI, felt very "off the grid re: electronics!" But sometimes that can be good. Very quiet and dark - lovely for looking at stars. Park is part of the Lajitas Golf Resort across the street so can use their facilities also. If we come to Big Bend again, we definitely would stay here again. We camped at Maverick Ranch RV Park at Lajitas Resort in a Fifth Wheel. National & State parks are the reason people go to this area, but in addition... DB's Rustic Iron BBQ is amazing; open Wed-Sat 11:00 "until gone" so go early. Take the Golf Cart Tour at the hotel; views are wonderful. Don't miss the charming trip across the border to Boquillas, Mexico. It's at the end of the road in National Park. Need passport. Take small bills for fees and tips. La Kiva Restaurant is underground and interesting to see. This is the only place I would stay visiting Big Bend. The interior roads are paved, the sites level, and a paved pad. Good utilities. Large sites, most are pull through. Outstanding facilities, clubhouse, beautiful pool, laundry. There has been a lot of money put into this resort. We stayed here to see Big Bend. It is a little bit of a drive, but well worth it. Especially after we saw all the other options in the area. Now there is dust, but that is part of the area. The sites don't have much if any grass. There are picnic tables and a patio. The park is adamant about dark skies and it is well worth it. The stars are magnificent. Don't let the 20 miles to the west entrance bother you. We camped at Maverick Ranch RV Park at Lajitas Resort in a Motorhome. Be sure and drive to Presidio. But don't take your RV on that road. All sites are FHU 30/50 amp. Most pull throughs. Good spacing, you share utilites, so the trailers are set off door side to each other. Some have cable. 3G Verizon, Ok WiFi, dog run & pool. Big laundry & clean bathroom. Helpful staff. You can walk across to the Lodge for dining options & golf. For groceries go to Terlinqua to the store Cottonwood, more options. Prices are high for groceries. Bring what you need for your stay. Also it's about an hour to the visitor center of Big Bend National Park. Beautiful views from your site. 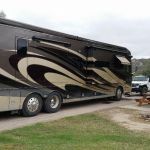 We camped at Maverick Ranch RV Park at Lajitas Resort in a Fifth Wheel. Great stay. Beautiful pool area. Nice dog park. The park spaces are set up with alternating directions in the pull thoughts, so there is a large open space between each site. Large rock fire pits and picnic tables available at each site. The spring desert blooms were gorgeous. It is about a half hour drive from Maverick RV Park to the ranger entrance station to Big Bend National Park. At the ranger station you can get an entry pass good for one week. The park is very large. There is also a park campground at the far end within the National Park that accommodates RV camping. We camped at Maverick Ranch RV Park at Lajitas Resort in a Motorhome. We spent almost a month here while visiting Big Bend. The reservation process was quick, and the check-in process was very efficient. Roads through the park were more than wide enough for our 38' coach while pulling our Jeep. Sites were level, hookups were well placed, and they all worked very well. Sites were oriented so two units shared the same utility pole and water, which gave you a lot of room out your front door to enjoy the picnic table and fire ring. There were no trees to obstruct your satellite. Verizon cell phone service was spotty and the park wifi was spotty, but workable. This is a night sky park, so they ask all external lights be off by 9PM. The night sky out there was beyond description. They have a clubhouse with some live music, and a nice pool. You can also access all of the amenities at the Resort. The views of the terrain from our site and the RV park are just beautiful. Yes, there is dust, but it's the desert. We really hated to leave the area and will be back next year. We camped at Maverick Ranch RV Park at Lajitas Resort in a Motorhome. The park is on the doorstep of the State Park, but about 30 miles from the National Park Headquarters at Panther Junction. There is a NP entrance station on the way to Panther Junction on TX 118. It's not a bad drive at all, enjoy the scenery. 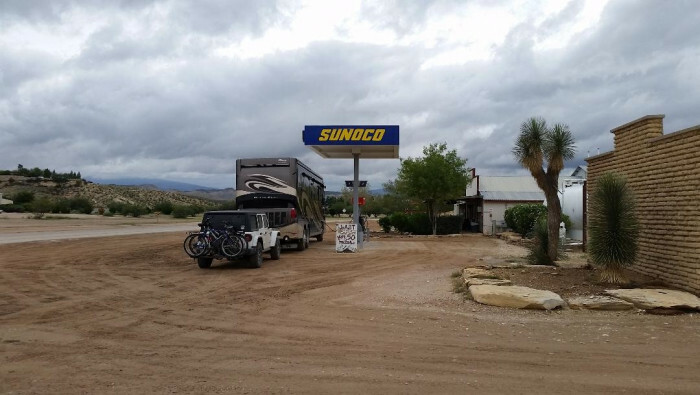 You can find gas in Study Butte, but we bought diesel in Alpine for the coach before taking Texas 118 south, which is the way I suggest going to reach Lajitas rather than using US 385 south through the NP. Be sure to bring food as there are limited choices in Terlingua. Skip the Lajitas General Store for buying anything (it's affiliated with the Resort and prices are way out of sight), instead use the Cottonwood Market in Study Butte. You'll pay more but they are not unreasonable. Great places to eat in Terlingua at all ranges of prices. We didn't have a bad meal there. Chili Pepper cafe and The High Sierra were less expensive but very good, Starlight Theatre a bit pricier but also very good. Try the pizza at La Kiva. Be sure to take Texas 170 west through the State park to Presidio Stunning views, Ft. Leaton is an interesting site to see just outside Presidio. We crossed into Mexico at Boquillas, if you want to do that have a Passport or Enhanced Driver's License. Best Park in area but a bit stark. Facilities are excellent but most on the grass is either distressed or dirt instead. A lot of exposed dirt.That said, even when windy, there was no dust. Sites are big and Big Rig friendly, but without character. I was there 6 days the week preceding Thanksgiving week. It was only 15-20% full, which can't be good as a business. There is an excellent restaurant in the resort across the street as well as a world class golf course. I didn't see much play so wonder if they can be profitable, but the restaurant was busy. I would stay here again. We camped at Maverick Ranch RV Park at Lajitas Resort in a Motorhome. We expected a Resort but the Resort is really across the street. It seemed Maverick Ranch was a bit more exclusive when back in the day when first built but time has passed and it could use some landscaping. In all fairness they just had a tremendous amount of rain for the area and it was muddy everywhere. The food was good across the street at the Resort and the Golf was excellent and well worth the $125.00 Green Fees. 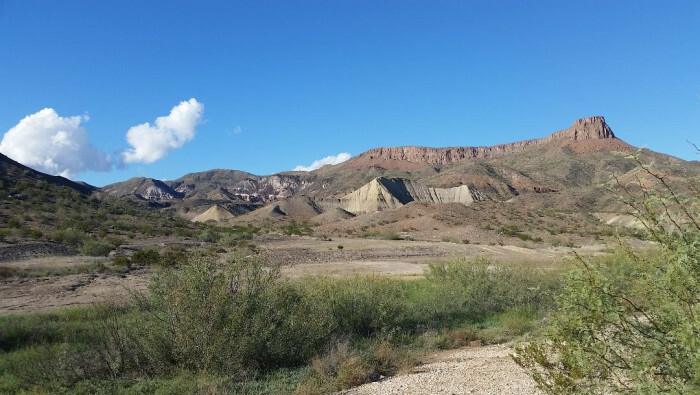 It is all in a good location to visit both National and State Parks and although the suggested trip to Presidio, TX had spectacular views there is absolutely nothing there. The Staff is very friendly, but not much is going on there at this time of year. We would return someday just to do more Park exploring and another round of Golf. We camped at Maverick Ranch RV Park at Lajitas Resort in a Motorhome. Try to get a perimeter Site and you will have a beautiful backyard. There is plenty of Hiking and off-road exploring at Big Bend National Park. We did not explore much of the interior of the other local State Park. Make sure you keep your fuel level up as gas stations are fairly remote. Not many options for local food if you tire of cooking. A great park to stay at if visiting the Big Bend area. The park is big rig friendly. The way the pull thru are set up you will have your passenger side facing a neighbors passenger side, but as noted they are a goodly distance away so that should not be an issue. The local resort does have a restaurant and bar. All utilities worked well and I would come back again. Also the easiest way down from the north is the road from Alpine as the roads in the state park or national park are narrower and have many more curves and hills. We camped at Maverick Ranch RV Park at Lajitas Resort in a Motorhome. Staff is exceptional, very helpful and knowledgeable. Park is mostly gravel with small amounts of shade. Sites are long and wide with hot top pads. The amenities were great, pool, clubhouse area, and laundry at $2.00 a load. 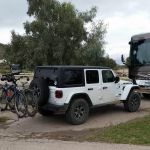 We camped at Maverick Ranch RV Park at Lajitas Resort in a Fifth Wheel. Enjoyed the saloon at the resort and had a very nice meal. Made visits to Big Bend National Park and took a ride to Presidio while here. Stop and see Terlingua ghost town and stop in at the Trading Post there. The Starlight theater (a dining/bar area with live music) was an unexpected pleasure as well. Quiet campground. Sites are level and very wide - about 30 ft. You're facing your neighbor but so far apart we found that no problem. Restrooms were very clean. Large pool. Little shade. 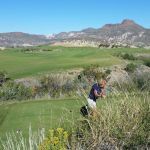 The campground is part of the Lajitas golf resort and you're entitled to make use of the hotel facilities including a nicer pool area. Your site number is your 'room' number. TV via cable was blurry. No T-mobile phone coverage. AT&T was ok. Campground is a 'dark sky community' - after 9PM all exterior lights must be out. It's a shame that the hotel lights across the street remain on during the whole night. Best sites (regarding available shade) are 85, 87, 89 and 101. 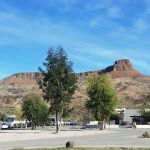 We camped at Maverick Ranch RV Park at Lajitas Resort in a Fifth Wheel. If you don't know which road to take from the North out of Marfa when towing; the 67 > 170 via Presidio OR the 90 > 118 via Alpine, go via Alpine! It saves you lots of short steep climbs and very steep descending turns along the Rio Grande on the 170 from Presidio to Lajitas. May be the best park around, but that's not saying much. dirt, dirt, dirt. Spots were level. We camped at Maverick Ranch RV Park at Lajitas Resort in a Travel Trailer. Its a nice place in a wonderful location and it has a very nice pool with cabana, but its not a "resort". Its just a nice rv park attached to a resort. A "resort" would have level sites, nicer showers, better wifi, available ice, etc. We camped at Maverick Ranch RV Park at Lajitas Resort in a Travel Trailer. Big Bend National Park is spectacular. 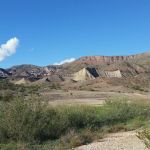 The nearby Lajitas and Big Bend Ranch State Park bicycle trails are great. The general store (Sunoco station) is very nice, well stocked. Can't say anything about the golf course or non-rv resort facilities. Great layout with trailers going both directions with very large spaces between. Wonderful natural stone fire pits that are cleaned out every day by staff. Heated pool laundry facilities dog park etc. 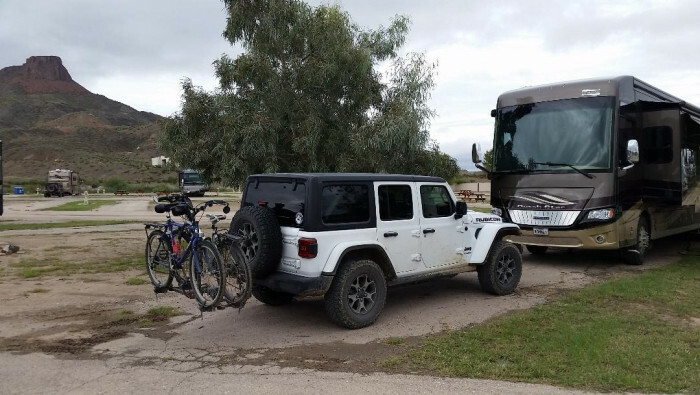 We camped at Maverick Ranch RV Park at Lajitas Resort in a Fifth Wheel. The park is on the doorstep of the State Park, but about 30 miles from the National Park Headquarters at Panther Junction. There is a NP entrance station on the way to Panther Junction on TX 118. It's not a bad drive at all, enjoy the scenery. 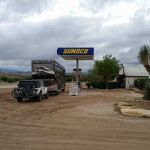 You can find gas in Study Butte, but we bought diesel in Alpine for the coach before taking Texas 118 south, which is the way I suggest going to reach Lajitas rather than using US 385 south through the NP. Be sure to bring food as there are limited choices in Terlingua. Skip the Lajitas General Store for buying anything (it's affiliated with the Resort and prices are way out of sight), instead use the Cottonwood Market in Study Butte. You'll pay more but they are not unreasonable. Great places to eat in Terlingua at all ranges of prices. We didn't have a bad meal there. Chili Pepper cafe and The High Sierra were less expensive but very good, Starlight Theatre a bit pricier but also very good. Try the pizza at La Kiva. Be sure to take Texas 170 west through the State park to Presidio Stunning views, Ft. Leaton is an interesting site to see just outside Presidio. We crossed into Mexico at Boquillas, if you want to do that have a Passport or Enhanced Driver's License. Big Bend National Park and Big Bend State Park. So much to do! I recommend taking the all day float trip on the Rio Grande through Santa Elena Canyon (half day trip is not as good and does not go through Santa Elena Canyon). Ask for an end site. Take the drive to Presidio and checkout the beautiful views along the way. DB's BBQ Truck in Terilingua has some of the best brisket I've ever had and will sell you a whole, smoked/frozen/vacuum packed chicken for $10. Santa Elena Canyon in Big Bend NP is close and worth the visit. Big Bend NP is worth the long drive to get there. No shopping so come fully stocked. Our GPS took us through Presidio which was longer and the road not as good as the road from Alpine. Take a camera, a jacket and binoculars everywhere. Drink a lot of water, this place dries you out. Visit the 'Short Time' liquor store in Terlingua. Plan on stargazing, this is a dark sky r.v. park and the constellations will blow you away. 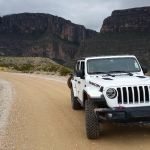 Terlingua Ghost Town, Big Bend National & State parks are must sees. This place is about 17 miles from Study Butte... we did most of our touring in Big Bend while staying here in Lajitas. Bring groceries with you... they are a bit expensive here... See Big Bend! Boquillas Crossing was great and the park ranger full of fantastic information. Passports required. Terlingua's Starlight Theatre, kitschy and fun, with good live entertainment and decent prices on drinks and food. If you don't want to drive, you can walk across to Candelilla and the saloon, but be prepared to pay more than $10 for margaritas that aren't fantastic. The food was good, try the pulled pork tacos. Walk across the street for breakfast at the golf resort. Go ziplining, the operator is also at the golf resort. Walk or bike just up the road to visit Clay Henry, the goat-mayor of Lajitas! Go to the border crossing in Big Bend National Park, where you can pay $5 for a round trip, by row boat and burro, to Boquillas Del Carmen. Also, if you have jeep or a high clearance 4x4 explore some of the unimproved roads that take you into the interior of the park. Visit the hot springs. Go to the visitor's center by the Chisos Mountain Lodge, were you can find the latest information on black bear and mountain lion activity. Eat at Candelilla's across the road. Go to the Starlight Theater in Terlingua Ghost Town (food mediocre, but good entertainment), Big Bend National Park, especially Chisos Basin (gorgeous), cross the Rio Grande and eat in Boquillas (need passport), and shop at the Cottonwood Market in Terlingua for a good selection of organic foods. The real fun is the Boardwalk area on the top of the hill outside of the park. The Thirsty Goat is great and the Food at the restaurant is good. The service is great. We were there on Friday and Saturday nights, and the music was good. The elected a goat and his wife Mayor of Lajitas... so they know how to have fun. Take every thing you will need. Groceries are limeted. Gas and Deisel are available in Lajitas as well as the national Park. This is a desert, be prepared. Enjoy the stars. FYI-bring groceries and gas. Your a fair distance to anything. The general store is next door for most major staples, but it can be a little pricey. Big Bend NP is the big attraction. Took us three full days to see all the park. The Lajitas Golf Resort and Spa is very nice. We did the Starlight Evening Dinner. Expensive ($150 pp) but very nice. The drive up to Presidio was very scenic, especially the first 20 miles out of Lajitas. Had lunch at the El Patio restaurant in Presidio. Went across the border to MEX, but not much going on and never did find the "tourist area." Definitely play golf at Black Jack's Crossing just up the street. A spectacular Lanny Watkins designed course. 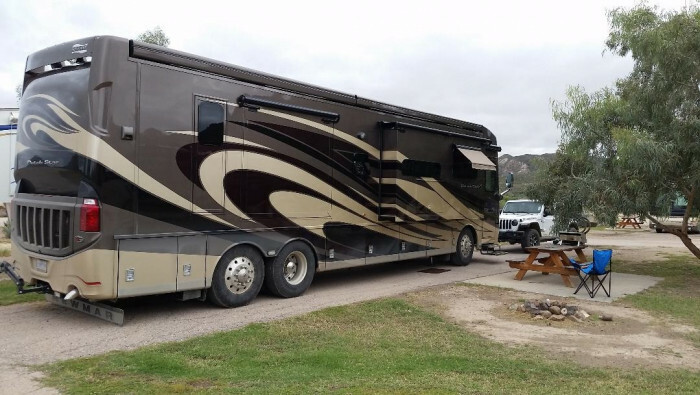 Use this RV park as a base while visiting Big Bend State Park. Spend time in Terlingua. Great Pizza at the Long Draw. When choosing your site, if you have a motorhome, you may want to chose a pull in site that faces the mountains on the outer rim of the park. Take advantage of the resort activities...Zipline, horse back riding and shooting or golf. You must call to get a reservation. Be sure to drive to Presidio, the drive is spectacular. Terlingua is worth a visit and The Starlight Cafe had excellent food. The golf course Black Jacks Crossing was great, but other than that, there was not much to do. The town has a set of local trails that are worth visiting if you don't want to drive to one of the parks. We had cocktails at the resort bar outside. Restaurant has the best 14.00 burger I have had. Hit the Terlingua Trading post porch around sunset. La Kiva for drinks. Starlight Theater adjacent to the porch. Road biking is good. Mountain biking in the resort and the State Park is a blast. There is a well stocked market in Terlingua on Hwy 118. Tip. When you get here, wind down and relax. This is West Texas. Go with the flow and you will have a great time. Beautiful drive to Presidio with Rio Grande beside the road much of the way. Enjoy Big Bend but check out this drive. Maverick Ranch was a great base camp for all there is to see in this huge area. Well stocked General Store outside campground. Visit Starlight Theater/Restaurant in Terlingua, food and service good, and the locals show up in late afternoon for a beer on the porch. Take a trip across the border to Boquillas del Carmen. Don't forget your passport. Nearby shopping was relegated to the "company store(s)" in Lajitas. We were in this area to see Presidio and Big Bend Nat'l. Park, and points between. Fuel (both gas & diesel) is available in Terlingua, and not a great deal of difference in price than in Alpine. There is also fuel available in the Park, as well as at Presidio. Other shopping is also available in Presidio. 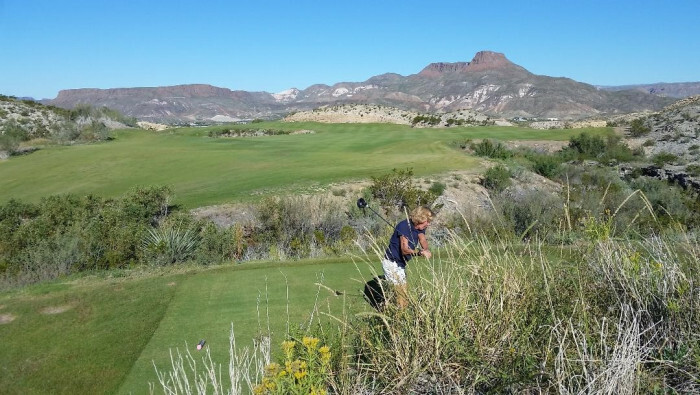 This is near Big Bend if you are not there to play golf. Awesome Ntl Park. Should take about 3 days to see it, that is what it took us. Tried to go to Presidio but highway is VERY twisting and I was car sick. Worth it if you can go though, beautiful scenery. Don't bother with Terlingua 'Ghost Town' nothing there. Their idea of 'ruins' is old building from the '20s (1920 that is) Ha, my house was built in 1928. Nothing else much to see there. Near Big Bend National Park and Big Bend Ranch State Park. Lots of interesting things to do and see. There is a gravel road behind the park that leads to a housing development area which is great for walking dogs. The tent area is also another great spot for walking the dogs. There are also trails that lead to the butte nearby if you want to do a little hiking. The Big Bend Ranch State Park allows dogs on trails only leading away from the state park. Trails heading towards the Rio Grande are ok.
Are you affiliated with Maverick Ranch RV Park at Lajitas Resort ?